Freight companies have changed how they calculate package shipping. Here's how to calculate and mitigate the impact. If you haven’t taken a look at your shipping invoices lately or talked to your freight rep, you probably should do so before the day is out. Significant changes have been made in the way shipping costs are calculated and it will impact your bottom line – no matter what you’re shipping. For years, carriers have struggled with how to accurately charge for the space a package takes during transit. If you’re a carrier, you can’t just charge for the space, because the heavier the item, the more fuel it takes to ship it, but if you charge based on weight alone and not for space taken, you’ll end up losing money on the vacant air inside boxes and packages. You also end up needing more and more cargo space as packages become larger and larger to protect the contents inside. As a carrier with a finite amount of space available (aircraft cargo space, semi trailers, cargo vans, etc. ), you need to make sure each cubic inch is profitable. There’s no money to be made in shipping air (the empty space inside a container), so carriers found a way to encourage shippers to reduce their packaging sizes, thereby enabling the carriers to ship more in the limited space available per shipment – carriers went to dimensional weight shipping for all freight. 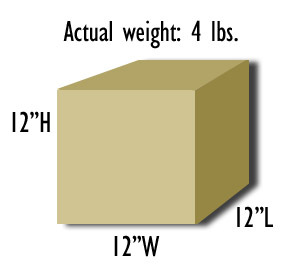 What is Dimensional Weight Shipping? Dimensional weight shipping is a calculation process that helps account for space taken by a package along with how much it weighs. It is probably the largest impact on shipping that has happened in the last 30 years – that’s how pivotal it is to your shipping operations. Overall, the use of dimensional weight has the potential to increase your shipping costs 20% or more. Coming at the same time as annual base rate increases and combined with extraneous fees and surcharges for things like residential and remote deliveries, fuel surcharges, and “out of week billing adjustments” (for not including dimensions at time of manifest), shipping can increase into the 30% range this year. It basically calculates the cubic space a package takes then divides that total by the DIM factor, a number selected as the base weight for 1-cubic foot of space. Each carrier has their own DIM factor but the most common DIM factor number is 166. From here it gets a little tricky – you still have to know the actual weight. Once you’ve figured out the dimensional weight, you compare it against the actual weight, and whichever one is the large of the two becomes the Billable Weight. The billable weight is then used to calculate the shipping rate by your carrier. Now, you compare the Dimensional Weight to the Actual Weight: 11 lbs. vs. 4 lbs. The larger of the two becomes the billable weight: 11 lbs. When multiplied by the ship rate to, say, Zone 2, you get a cost of $9.40 ship rate when using the dimensional weight, while using the actual weight nets you a cost of $7.11. That’s where the grumbling starts. You now see a significant difference in shipping costs. But, don’t whine for very long – it’s costing you money for every package that doesn’t have dimensions listed that leaves your shipping department. What can I do to minimize the impact? Minimizing the impact of dimensional weight on your shipping costs comes down to some very smart measures you should probably already be using. As in all lean operations, optimize, optimize, optimize! Large package surcharges are incurred if the package cubic space (length plus girth [(2 x width) + (2 x height)] is greater than 130 inches, and may be subject to a minimum billable weight of 90 lbs. While the increase in shipping costs might be a concern, you can reduce its impact on you. Analyze your packaging operations, take a look at getting dimensional and weight information into your warehouse management system, optimize packaging through training and technology, and talk to your carrier about what they can do to help you improve shipping operations and cost. They have good reason to assist you – they want to carry more orders in every shipment in order to increase their profit margin. They can help you with yours, too. 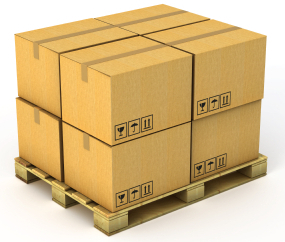 In the near future, these factors will begin to affect some LTL and palletized shipping. This process has already begun, but has not taken root to the extent it has for package shipping.